A quiet spot. No TV. A snack and perhaps a bit of down time first. You know the drill and are following it whenever you can. So why is homework still such a hassle? Why does your child complain for 40 minutes before getting started? Cry that he doesn’t understand and then scream, "That’s not what my teacher said!" when you try to help? Make homework time as consistent as possible. If your child is doing it one day at the kitchen table, another in the car on the way to soccer, a third spread out in the ballet waiting room, expect to have some trouble. 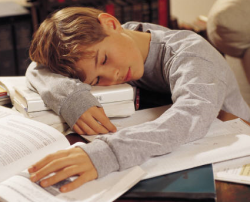 Homework is a bit like sleep: our brains and bodies need cues to know that it’s happening to kick into the focused gear necessary to get it done efficiently and well. 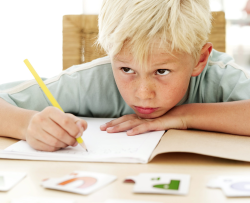 If there is absolutely no way to create a same-time, same-place homework routine, round up some props – a homework mat to sit on, a homework-only pencil – and start the routine the same way each time, perhaps with some breathing and finger stretches to signal the brain and body it’s time to begin. Again, take a page from bedtime: once the routine begins, set limits to squelch your child’s (natural) desire to derail the process. Have something good that follows homework (Grandma’s Rule), and the agreement that your child only gets that – whatever it is – if she cooperates. How do you define cooperate? Not getting to "3". Use Thomas Phelan’s 1,2,3 Magic: Effective Discipline for Children 2-12, approach to set clear limits on delay tactics, including fussing. This approach only works if you follow the system exactly – no bribing, threatening, getting involved in something of your own and forgetting to track what your child is doing. If you aren’t familiar with the system, please see Phelan’s excellent book. Set a reasonable amount of time for getting homework done and stick to it. Many teachers use the 10-minutes per grade rule (10 minutes of homework for a 1st grader, 40 minutes for a 4th grader), but check with your child’s teacher to clarify his or her expectations. When you say it’s time for homework, the clock begins. Kids who spend a long time stonewalling aren’t going to get done and will have to face the teacher the next day. Notify your child’s teacher in advance that you are doing this, but do not attempt to rescue your child from having to face the consequences (no getting up extra early the next day to do it before school). Most children want to please their teachers and do not want to arrive at school empty-handed. Whatever your child’s "cookie" (the good thing that happens after homework is done), if your child hasn’t finished homework by the end of the time period, that privilege is lost for the remainder of the day. By the same token, kids who rush through their homework will benefit from this system as if 30-minutes have been designated for homework, that’s the amount of time your child needs to spend. If she rushes through her work and is finished in 13 minutes, she needs to spend the next 17 minutes doing something else school related. Sloppy, careless work fades away when kids are no longer rewarded for rushing. If your child holds you hostage during homework – requiring your presence to get anything done – wean him through use of a token system. Give your child 3 tokens, then get busy doing something interruptible in the same or a nearby room. When your child needs assistance, he can use a token to call you over. Begin by asking, "Are you sure this is worth a token?" If your child says yes, take a token (this works much better if there is a physical token your child needs to hand to you) and provide a bit of help, then leave. This can be repeated up to 3 times over the course of a homework session. If your child asks for help a 4th time say, "I’m sorry, you’re out of tokens." Create an incentive for saving tokens, and have your child chart how many are left at the end of each homework sessions. If your child used just 1 token, he gets 2 points. If he used 3 tokens, he doesn’t get any points. Talk with your child ahead of time to agree on something fun to earn, perhaps a trip to the climbing gym, a family game night, some one-on-one time with a parent. Determine the number of points needed to earn the reward, rewarding reasonable (not perfect) effort. The combination of structure, limit-setting and incentives works well for most children, helping to instill the work habits – and ultimately the attitude – necessary to make homework more productive, more efficient, and maybe (dare I say) fun.